Your great-grandmother was a boxer too! 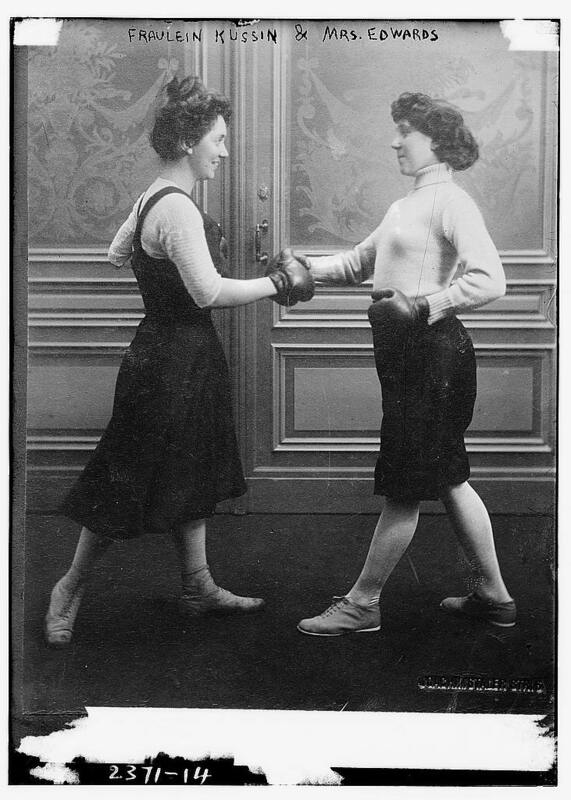 Having spent the better part of four months living and breathing women’s boxing from the perspective of gender (i. e., the only “acceptable” female boxer is a “girly-girl” boxer in pink and other such canards) — I thought it might be fun to remind folks that female boxers have been around for a LONG time. Here are a few samples from newspaper articles published around the country in the early part of the 20th century (click on the links). This article from The Hartford Herald was published on May 1, 1912 and describes a 7th round knockout by Myrtle Havers, 18 over Mabel Williams, 32 in a 10-round professional fight in Saginaw, Michigan. In declaring Havers the winner, she was also named the girls champion of Michigan. I remember finding that picture in the Library of Congress digital archives. Always wondered how the bout played out. There’s another one in there somewhere of Billie Burke (later Glinda the Good Witch in The Wizard of Oz) sparring another woman in a still from a silent movie. Thanks for the tip on Billie Burke! I’ll try to find it!